To celebrate National Learning Disability week, we met with Neil Morrisroe, Service Delivery Manager from the Learning Disability Community Support Service in Adult Social Care. The service provides a range of support services for over 1000 adults with learning disabilities, their families and carers. In his interview, Neil talks about how the service has embraced technology to help improve services for people with learning disabilities, and explains how technology can offer new and improved opportunities for enhancing communication. Hi Neil, could you tell us briefly about your role? 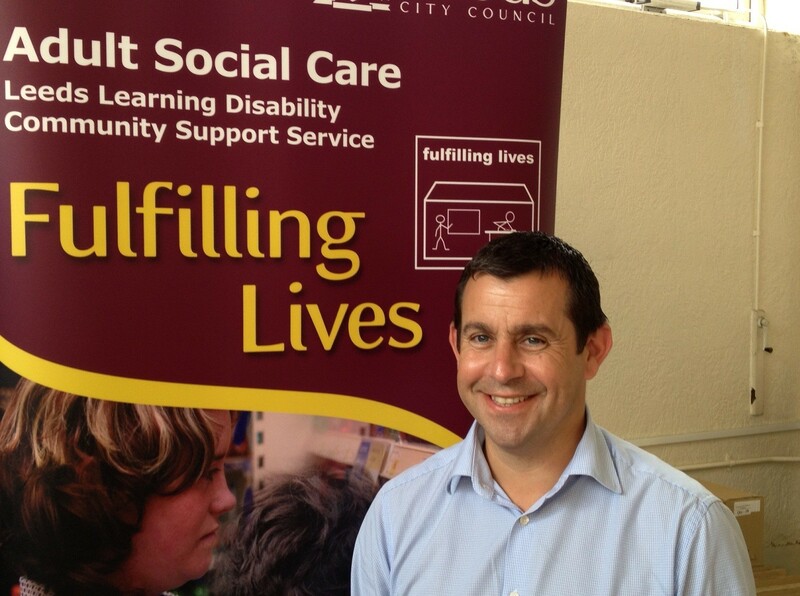 I’m the Service Delivery Manager for the Learning Disability Community Support service – this is the in-house provider service for adults with Learning Disabilities in Leeds. We provide support to over 1000 people and offer this support in people’s own homes and in our Fulfilling Lives Services and Respite/Emergency Services. What is the role of technology in improving or enhancing services for people with learning disabilities? It started a number of years ago when we realised that advancements in technology would have a significant impact on the people who use our service and could potentially make a real difference to their lives. We had a number of staff who had a real interest and expertise in this field and were doing pockets of really good practice in their individual services. To ensure that this good practice could be shared we set up a group called ‘Technology Matters’ which had staff representation from all of our services. What are we doing in Leeds to overcome this? The Technology Matters group meeting is held every 3 months and staff are encouraged to showcase new technologies they have discovered and share experiences they have had with customers who are using technology to improve their lives. This has included mobile phones that are designed with only 5 large buttons and allow for single touch dialling, which is extremely useful for people with limited movement in their hands. These phones are also pre-programmed and have allowed customers to be more independent as they can now contact staff when they are out by simply touching one button on their phone. More recently we have been using iPads and apps to great effect and have purchased a number of these devices and the accompanying apps to help support customers with communication. Our Fulfilling Lives service at Bramley has been used as a hub for staff and customers from other areas of Leeds to come and see the iPads and apps before they decide to buy them, thus ensuring that they don’t waste money on equipment or software that isn’t useful to them. What difference do you believe this will make to people’s lives in reality? Well I can give you two great examples – one of our customer’s Paul is only able to use his left arm and index finger. Using an iPad and communication software called ‘proloquo2go’ he is able to point his finger and use the software to speak for him. Staff are also able to customise the software to make a page for each subject which increases the speed it takes for Paul to communicate his needs. Although communication aids like this have been around for some time, the real benefit of using the iPad is that not only are they much cheaper than the traditional equipment but that they are multifunctional, and whilst Paul may use the device to communicate, other customers can use other apps/functions to improve their literacy. With the amount of apps available the benefits are almost limitless! Another wonderful example is Susan’s story. Susan often has difficulty making herself understood and the staff who support her have been relying on signs and symbols which help her explain herself and also to communicate to her. Whilst this works to a degree, staff felt that exploring the use of an iPad and the range of apps that are available was the next step. They identified an app called ‘Scene and Heard’ that Susan is able to navigate and use that to give her the ability to communicate more effectively. This app gives her the ability to be able to communicate via pictures that link to audio descriptions of the activities that she has been doing. Staff are going to use it to enable her to plan and make more choices when doing her food shopping each week. It also gives her the ability to go home to her family at a weekend and explain what activities she has been doing through the use of the pictures that she will take and any audio descriptions added to these. At present her family currently rely on speaking to staff to find out the details of things she has been doing – this will now give Susan a chance to say this for herself. Having the use of the 3G iPad within the service meant that the staff were able to use the iPad to demonstrate what things she could do with it. As her home has no internet access this is an invaluable resource. It has and will enable staff to plan activities on the internet such as looking at shows and movies, and being able to watch clips on Youtube. Susan has been experimenting with the iPad over the last month or so. She has developed the ability very quickly to use the basic functions such as swiping, double tapping and expanding the screen size. The staff team are very excited at the prospect of being able to have a means of communicating better with Susan, and her family are also looking forward to seeing the results of this. Many thanks to Neil for sharing his thoughts. If you would like to find out more about how to access the service, click here.